Through the use of natural botanicals, JUARA believes your skin can be the "champion" (or the "juara") over environmental aggression, making it healthy and beautiful. The JUARA Girl - The name represents empowerment in following your dreams and being the "JUARA" or champion of your own destiny. 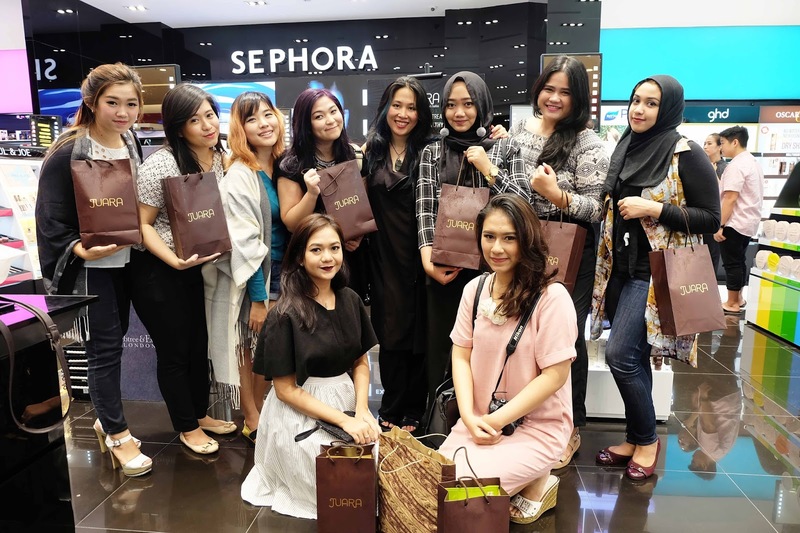 Long story short about how JUARA founded was the story of 4 women who took a risk, left their jobs and took the plunge to follow the passion of starting a line with a natural philosophy they believed in, despite the highly competitive US landscape. 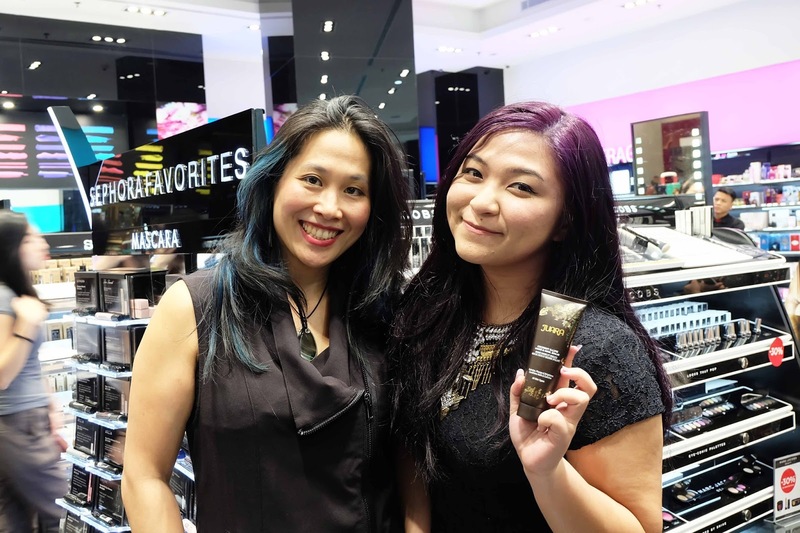 The founders are four creative, culturally-diverse young women who shared a vision to build a brand that combined their western upbringing with their Asian ancestry to create results-driven skincare. They took a big risk to start an Indonesian inspired brand in the USA. The founders are; Tami Chuang, Jill Sung, Yoshiko Roth and Metta Murdaya. Metta is the one from Indonesia but lives in the USA (the one i meet at the event as well and she's totally friendly), she's the one with the ideas of bringing Indonesian traditional herbals medicine and ancient royal beauty rituals as a skincare line. She even designed the pattern that you're going to see in most of JUARA packaging, inspired by the one and only, Batik. Soooo, you might asking, is this a Indonesian brand or US? It's actually a brand from USA because it made in the USA, all the ingredients processed in the USA now, but the brand does inspired from Indonesia and Indonesia's tradition herbals a.k.a JAMU. Explaining the name, the pattern on the most of packaging and the ingredients. In short, JUARA is a blend of herbal tradition and botanical science. It's also safe to use as they claimed to be: Dermatologist Tested. 100% Vegetarian. Free of Parabens, Sulfates, Phthalates, Mineral Oil, Gluten, Artificial Colorants. No Animal Testing and No Harsh Chemicals. Now, about the new product, Juara Coconut Illipe Hand & Nail Balm is a ultra-rich hand treatment provides long lasting hydration for dry hands, especially after hand washing, and helps strengthen nail and cuticles. A concentrated of nourishing coconut, candlenut & buriti oils, skin-softening Illipe butter and age-delaying oat bran work synergistically to reduce the appearance of fine lines, plump skin, and help fade age spots. The warm scent of freshly cut coconut and tropical flowers transports you to paradise everytime you use this hand balm. Also help skin left feeling soft, smooth and extremely hydrated. Conditions nails and cuticles to help your manicure last longer. Coconut Oil - Hydrates, Naturally Antiseptic. Coconut oil is rich in lauric acid, which has antiseptic properties, making this naturally fragrant oil the oil of choice for problem skin and those with rosacea and psoriasis. Illipe Butter - Moisturizes & Protects. Provides a cushion barrier to protect skin from water and harsh elements. Wild Mangosteen Butter - Antibacterial & Rich In Vitamin C. Mangosteen, a fruit known for its high content of vitamin C and antioxidants, helps to brighten skin and fortify the skin's natural protective barrier against free radical damage. This nourishing butter is good for all skin types, providing the skin with rich hydration without leaving it greasy or sticky. Rice Brand Oil - Maintains Elasticity. Rich in natural vitamin E and essential fatty acids, rice brand oil intensely hydrates and helps maintain youthful elasticity. Oat Brand Extract - Plumps, Soothes & Even Skin Tone. Oat bran, used colloquially to soothe and heal open sores, reinforces skin's natural moisture barrier to help protect it from the drying effects of water, wind and other harsh element. It moisture binding properties also help plump fine lines and wrinkles, soothes irritation, minimize skin redness, and condition nails and cuticles. Buriti Oil - Protects & Repairs. Harvested from the tropical Moriche Palm Tree, buriti oil has traditionally been used for skin healing purposes and to soothe sun stressed skin. Buriti oil is a highly nutritious oil that helps to protect skin, restore hydration and protect elasticity with its high content of essential fatty acids, vitamin E+C and beta-carotene. That's the basic knowledge you need to know about the brand and the new product, nowwww, let's get back to my own review! Wonder how this works on me? Let's scroll! I love the simple packaging. It has a touch of traditional Indonesia look, but looks modern and elegant. I love the mixed between dark brown and gold color. Plus i also love the hand design pattern inspired by Batik. Overall the packaging is simple and elegant. I like it. The texture of the product is nice. Quite a perfect consistency, not too watery and not too thick. Really easy to absorb and leaves your hand really moisturized. Perfect when you have a dry hand. I really love to use it when my hands feel dry, but i will not use it when my hand is sweaty, because it's gonna feel too moist and it disturb me (yes my palms sweat sometimes and sometimes really dry). I've been using it for quite sometimes and mostly i use it almost everyday, once or twice, every time my hands feel dry and it works wonder! It's not sticky or greasy, only really moisturized, so i think it's really nice. In overall, i quite like this product, it's nice texture, nice soft feeling when used, not greasy or feel sticky, easy to absorb and really really moisturized the hand. This hand balm really help with my dry hand, especially a week ago when i painted my nails everynight, yep, 1 nail art theme every night for 5 days. My fingers, especially nails cried i guess, hahahaha. Luckily i have this, everytime i use the aseton (which dry my fingers and nails), i always use Juara hand & nail balm to comfort them, before applying another nail art. So happy i have this Juara hand & nail balm right on time when im using nail polish and stuff a lot (i rarely paint my nail because it's smalls and weird like a baby fingers). The only thing that i don't really like is the smell. Nothing's wrong with the smell though, in fact i might said most of you gonna find the smell is good. But unfortunately, like i always mention in few of my reviews, i don't really like something that smells sweet, this hand balm smells too sweet for my liking. Actually it smells like coconut and candlenut mostly, sweet and nice, but not for me hehehe. + free of parabens, Sulfates, Phthalates, Mineral Oil, Gluten, Artificial Colorants. If you have hand or nails problem, yep, this is the answer. And if you don't have dry hand or nails, you still need to use hand cream guys. Why? Because hands are part of our body that almost work all the time! Yep, and just like any other part of your skin, it's easily get old and wrinkled, and if i didn't remember it wrong, hands are the part of your body part that get wrinkles fast. Nah you don't want to be 20 with hands looking like 50 right? That's why hand cream is actually a must item. And Juara Coconut Illipe Hand & Nail Balm is one of the chosen body&nail cream hahaha. So say no more, go get yours at nearest Sephora Indonesia store (Mall Kelapa Gading, Plaza Indonesia, Kota Kasablanka, Central Park Mall, Plaza Senayan, & Discovery Shopping Mall Bali). That's all my review for now, i hope you guys enjoy reading it. See you guys on my next post! 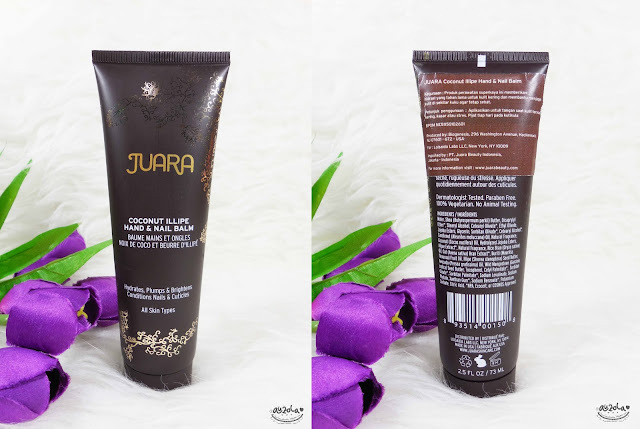 Thank for your sharing the review about the Juara Coconut Illipe Hand & Nail Balm, L like it i must use it, becouse i like your review and very imoressive, i have trust in you words, I must suggest this for my friends, I really admire your work and i hope in future i will return for more info. like this one.